It was the moon! 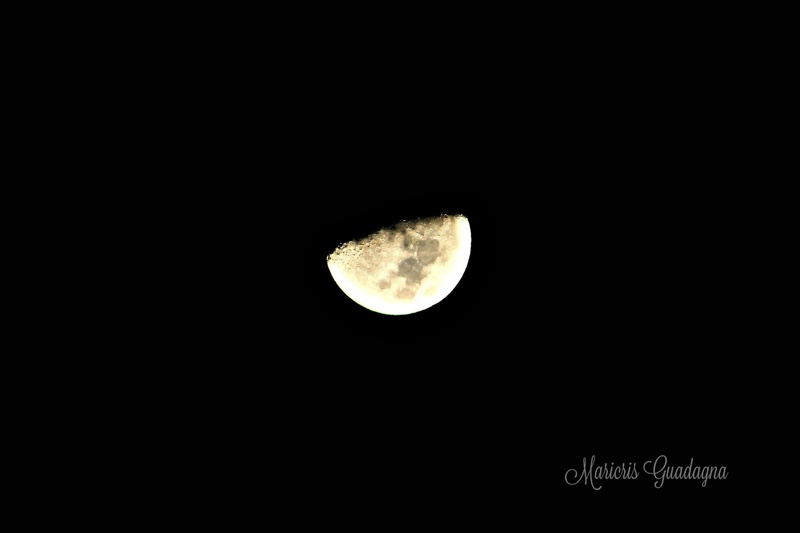 Half of the moon anyway. Just when I thought it was not visible that night. It was peeking through the dark sky like it was Adele telling me, "Hello, it's me!" . Yes, I went there. It can't be helped. It was a lovely sight! According to Moon Giant, the moon is on its first quarter phase. And due to the angle and rotation of the earth, the moon looked like it is upside down. However, it looks the opposite during the day when the moon, also called "Day moon" is visible during the day time - a scientific phenomenon that comes about due to the moon's Lunar cycle. The moon is a great subject if you want to push your boundaries further and your camera's limit by utilizing the proper setting to capture its elusive beauty while understanding the complex settings of your DSLR in the process. As for me, it has become an exciting challenge that I love taking part in whenever the opportunity presents itself. If you want to try your hands in capturing the moon yourself and getting to know your DSLR more, then I'll tell you the settings I use and works for me. Both photos featured here were captured using different exposure settings on Shutter Priority AE or TV on a Canon camera. You'll notice that it is a touch darker and visibly lacking its normal bright glow. This is due to the settings that automatically eliminated the brightness of the moon so it can better focus on the details of the moon. Craters are sharper and "shadows" on the surface of the moon is remarkably visible. The moon here features more "glow" on the outer rims as how our naked eyes would normally see it but with the added detail that the camera picked up. A little tweak on the ISO can make a lot of difference. If you want to achieve your own personal settings, play around with your shutter speed and ISO and choose the right number combination that suits your preference. Let me know if you have any questions and if you like this topic, please share it. In the meantime, go challenge your photography prowess. Keep Watch on January 24, where the moon will reach its full moon phase. P.S. Make sure you're using a tripod.